Since 1995, Nechami Wilhelm has been the Chabad rebbetzin of Bangkok. Over the past 24 years, over a million Jews, most of them tourists, have passed through her doors. At last week’s annual women’s gathering for Chabad emissaries–Kinus HaShluchos, Nechami Wilhelm shared her personal journey–from feeling that her mothering responsibilities were preventing her from effectively fulfilling her role as a Shlucha, to realizing that being a dedicated mother was actually the key to inspiring and connecting deeply with her fellow Jews. The following is an excerpt from her speech (you can watch the entire speech below). We call the Bangkok street our Chabad House is located on Bar Mitzvah Street. Outside, there are bars. Inside, a mitzvah. The challenge we face is so great. We meet travellers for an hour, a day, a week. How can we make our connection with them meaningful and0 everlasting? As I was pushing my oldest son’s stroller through the crowded, putrid alleyways of Khao San Road, I could not imagine how it would be possible to raise Chassidic children in a place of such physical and spiritual filth. Being the akeret habayit, the mainstay of the home, and also a shlucha is always a miraculous combination. In my own shlichus, I experience this paradox in all its might. In my early years, my children crawled between the travelers, with whom we conversed until late at night. But very soon, I was drawn into my home, and found myself busy with nursing, cooking, and diapers. Suddenly, I didn’t understand what I was doing in Bangkok at all! For many days, I contemplated the following question. If I am here to raise my children and be my husband, the rabbi’s, wife, then why do it in Thailand, of all places?! So I decided to bring the tourists, the women and girls, into my home. And there, between cooking supper and the puzzles in the playroom, I tried to deepen the connection. And hearing their stories gave me an incredible epiphany. One after another, I could hear how their mothers influenced them, and had a tremendous impact on every future step of their lives. The deep [universal] need for belonging, a home, was a deep revelation. It blew my mind. So what kind of mother would my own children have? Clearly, it was up to me to take care of my own diamonds. I turned 180 degrees. And came home to my kingdom, with joy. I realized that my true shlichus begins in my home. I am here happily, taking my place as a mother. We’ve uncovered the underlying connection [among our most diverse crowd of guests]. Everyone needs a home, and we all want to belong to a jewish home and the people of Israel. That’s the starting point of everything…The rest happens naturally. I believe my path as a shlucha is to fulfill my mission in the most feminine way possible. When my home is lit up, I can become a luminary to all. To this day, there are thousands of Jews today who have undergone a tremendous spiritual change in their lives, and got their start in Bangkok. it began with one real smile, a bite of chocolate cake, unconditional love, a sense of belonging. A true taste of home. [Click here to read the incredible story of my neighbor, now a religious mother of 4, whose encounter with Nechami changed the course of her life]. This speech touched me deeply, ty for posting! Thank you, Chana, for posting this beautiful and empowering speech. May Nechami continue to inspire us all as she fulfills her holy shlichus, and may she, together with her husband, continue to have true nachas from their beautiful family! 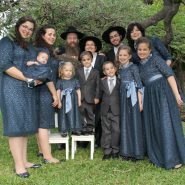 I believe that the Lubavitcher Rebbe said in his public talks to women, that even those who are not yet married and/or don’t yet have children,are no less endowed with this special nurturing quality about them, and in a tzniuadik way can have a tremendous impact and a great influence on others.